CAMBRIDGE, Mass.–(BUSINESS WIRE)–Cardurion Pharmaceuticals, a biotechnology company focused on the development of novel, next-generation therapeutics for the treatment of cardiovascular diseases, today announced preclinical results from its study of CRD-733, the company’s novel Phosphodiesterase-9 enzyme (PDE-9) inhibitor, in a poster presentation at the American Heart Association (AHA) Scientific Sessions in Chicago. In a study of mice with left ventricular hypertrophy (LVH) in a standard preclinical heart failure model, mice treated with CRD-733 were protected from LVH and showed improvement in several other markers of heart failure. As a result of Cardurion Pharmaceuticals’ preclinical data, the recent successful Phase 1 study in normal subjects, and the safety and tolerability of CRD-733 in more than 250 subjects to date, the company has now initiated its Phase 1b study in heart failure. The randomized, double-blind study is evaluating CRD-733 in patients with heart failure in the U.S. and Europe. The trial will include 44 patients in each sub-population of heart failure, heart failure with reduced ejection fraction (HFrEF) and preserved ejection fraction (HFpEF). Results are expected in 2019. CRD-733 is a Phosphodiesterase-9 enzyme (PDE-9) inhibitor. PDE-9 activity is abnormally elevated in heart failure which can impede activation of the heart’s normal responses to stress and make the heart more vulnerable to damage. In preclinical models of heart failure, inhibiting PDE-9 with CRD-733 restores these heart-protective mechanisms and has been shown to prevent and reverse heart muscle malfunction brought on by abnormal stress. Cardurion Pharmaceuticals obtained an exclusive, worldwide, royalty-bearing license from Astellas to research, develop, manufacture and commercialize CRD-733 for the diagnosis, prevention, and treatment of cardiovascular-related indications in humans. Heart failure is marked by progressive weakening or stiffening of the heart muscle and the organ’s gradual loss of blood-pumping ability. Although symptoms can be managed, this is a chronic condition with no cure. With more than 26 million people with heart failure worldwide1 and 6.5 million people with heart failure in the United States2, heart failure is the most important remaining unmet need in cardiovascular disease. In the United States, heart failure accounts for more than 1 million hospital admissions2 and costs approximately $30 billion dollars each year to treat3. Not only are these costs expected to rise to almost $70 billion by 20303, the incidence of heart failure is projected to rise 46 percent – resulting in more than 8 million people with heart failure in the United States4. There are two forms of heart failure: heart failure with reduced ejection fraction (HFrEF) and heart failure with preserved ejection fraction (HFpEF). HFrEF, formerly known as systolic heart failure, is characterized by a decrease in the ability of the heart to eject blood sufficiently during contraction. HFpEF is the form of heart failure that occurs when the left ventricle becomes stiff and though it continues to eject blood normally, in HFpEF the heart’s ability to relax is reduced, causing it to be unable to fill with blood sufficiently. The prognosis of patients with HFpEF is similar to that of HFrEF5. Roughly half of the patients with heart failure have HFpEF5, for which there are no approved therapies. Cardurion Pharmaceuticals is a biotechnology company with both clinical and preclinical programs focused on the development of novel, next-generation therapeutics for the treatment of heart failure and other cardiovascular diseases. Led by two physician-scientists with extensive experience in cardiovascular science, medicine, and drug development, Cardurion Pharmaceuticals’ unique programs and strongly collaborative environment enable the company to deliver promising treatments that target major unmet needs. Cardurion Pharmaceuticals has facilities in Cambridge, Massachusetts and Shonan, Japan. For more information, please visit the company’s website at http://www.cardurion.com. This press release contains forward-looking statements, all of which are qualified in their entirety by this cautionary statement. Any statements contained herein that do not describe historical facts, are forward-looking statements that are based on management’s expectations and are subject to certain factors, risks and uncertainties that may cause actual results, outcomes, timing and performance to differ materially from those expressed or implied by such statements. These factors, risks and uncertainties include, but are not limited to: the costs and uncertainties associated with our research efforts and other discovery activities; the inherent uncertainties associated with the conduct, timing and results of preclinical and clinical studies of our product candidates; and the adequacy of our capital resources and availability of additional funding. Except as otherwise noted, these forward-looking statements speak only as of the date of this press release, and we undertake no obligation to update or revise any of such statements to reflect events or circumstances occurring after this press release. We caution readers not to place undue reliance on the forward-looking statements contained in this press release. CAMBRIDGE, MASS. 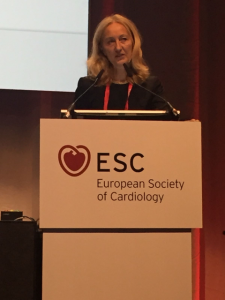 – [October 2, 2018] – The European Society of Cardiology Congress holds four specialized lectures each year and selects four renowned scientists who are seen by their peers as leading experts in their corresponding fields. The William Harvey Lecture on Basic Science is a noteworthy accolade and recognizes a member of the scientific community specializing in cardiology. Silvia Priori, M.D., Ph.D. was selected to deliver the William Harvey Lecture on Basic Science this year. On August 26th, Dr. Priori spoke about her inherited arrhythmogenic diseases study and the significant developments it has made in understanding the genetic basis of these types of diseases. With these results, she hopes to provide a foundation for gene therapies to fix the consequences of the flawed genes and bring new treatments to the clinic. “Receiving the Harvey Lecture Award is really a great feeling and arrived at a time in which the advancements in molecular medicine are reaching the clinics with the promise of a better future for our patients,” said Dr. Priori. Dr. Priori is a professor of Cardiology in the Department of Molecular Medicine at the University of Pavia, scientific director and director of the Cardiology Division at the Istituti Clinici Scientifici Maugeri and a director of the Molecular Cardiology Laboratories at the Centro National de Investigaciones Cardiovasculares Carlos III. Dr. Priori has received numerous prestigious honors and awards from scientific societies around the world, including the Distinguished Scientist Award of the Heart Rhythm Society and the Outstanding Research in Pediatric Cardiology award of the American Heart Association. Dr. Priori joined the Cardurion Pharmaceuticals scientific advisory board in September 2018. CAMBRIDGE, MASS. – [September 20, 2018] – Cardurion Pharmaceuticals, a biotechnology company focused on the development of novel, next-generation therapeutics for the treatment of cardiovascular diseases, today announced that the U.S. Food and Drug Administration (FDA) has accepted its Investigational New Drug Application (IND) for CRD-733, a Phosphodiesterase-9 (PDE-9) inhibitor in development to improve cardiac function in heart failure patients. Recent evidence supports that inhibition of PDE-9 has the potential to restore heart-protective mechanisms that are dysfunctional in heart failure, as well as improve heart muscle function and size. A Phase 1 clinical trial to evaluate the safety, pharmacokinetics and pharmacodynamics of orally administered single and multiple doses of CRD-733 in healthy volunteers was recently initiated. Cardurion Pharmaceuticals entered an exclusive licensing agreement with Astellas to develop and commercialize CRD-733 earlier this year. Heart failure is marked by progressive weakening or stiffening of the heart muscle and the organ’s gradual loss of blood-pumping ability. Although symptoms can be managed, this is a chronic condition with no cure. With more than 26 million people with heart failure worldwide1 and 6.5 million people with heart failure in the United States,2 heart failure is the most important remaining unmet need in cardiovascular disease. In the United States, heart failure accounts for more than 1 million hospital admissions2 and costs approximately $30 billion dollars each year to treat3. Not only are these costs expected to rise to almost $70 billion by 20303, the incidence of heart failure is projected to rise 46 percent – resulting in more than 8 million people with heart failure in the United States4. CAMBRIDGE, MASS. – [August 16, 2018] – Cardurion Pharmaceuticals, a biotechnology company focused on the development of novel, next-generation therapeutics for the treatment of cardiovascular diseases, today announced the appointment of industry leader, Jeb Keiper, as an independent member of its Board of Directors. Mr. Keiper joins founder Michael Mendelsohn, M.D., Ken Novack, Ed Mascioli, M.D. and chief executive officer Daniel Bloomfield, M.D. as members, along with board observers, Stephen Hitchcock, Ph.D. and Keith Gottesdiener, M.D. Jeb Keiper has 20 years of experience in the pharmaceutical and biotech industries with extensive expertise in financing and business development transactions. Mr. Keiper currently serves as chief financial officer and chief business officer at Nimbus Therapeutics, LLC, where he has overseen over $700m of capital inflows via a variety of financing and partnering transactions since joining in 2014. Prior to joining Nimbus, Mr. Keiper was vice president of business development at GSK Oncology and spent a decade at GSK in various business development leadership roles. Mr. Keiper led the oncology portion of the GSK-Novartis 3-business swap for $16b announced in April 2014. Earlier in his career, Mr. Keiper was a consultant at McKinsey and Company and worked in business development at TransForm Pharmaceuticals. Mr. Keiper began his career at Pfizer R&D as a bench chemist. He received four degrees from MIT: one in Chemistry, two in Chemical Engineering, and an MBA from MIT Sloan. For additional information on Cardurion Pharmaceuticals’ board and leadership team, please visit the company’s website: http://www.cardurion.com. Cardurion is a biotechnology company with both clinical and preclinical programs focused on the development of novel, next-generation therapeutics for the treatment of heart failure and other cardiovascular diseases. Led by two physician-scientists with extensive experience in cardiovascular science, medicine and drug development, Cardurion’s unique programs and strongly collaborative environment enable the company to deliver promising treatments that target major unmet needs. Cardurion has facilities in Cambridge, Massachusetts and Shonan, Japan. For more information, please visit the company’s website at http://www.cardurion.com. CAMBRIDGE, MASS. – [July 24, 2018] – Cardurion Pharmaceuticals, a biotechnology company focused on the development of novel, next-generation therapeutics for the treatment of cardiovascular diseases, today announced that it has expanded its leadership team with the addition of chief operating officer, Rebecca V. Frey, Pharm.D. Rebecca is a highly regarded leader who brings almost 20 years of strategic and operational biotech experience to Cardurion Pharmaceuticals. As chief operating officer, Rebecca will formulate strategies and lead all aspects of operations to maximize value creation. Prior to joining Cardurion Pharmaceuticals, Rebecca served as executive vice president of operations at Prevail Therapeutics, where she led clinical operations and early development planning. Prior to that, Rebecca spent eleven years at Alexion Pharmaceuticals. During her tenure, Rebecca held a wide range of leadership roles in development, project management and manufacturing, including vice president of operations and chief of staff to the CEO. Before Alexion, Rebecca spent six years in clinical operations and medical affairs at Novartis Pharmaceuticals. Rebecca earned her Doctor of Pharmacy from Northeastern University and completed her post-doctoral clinical research fellowship at Northeastern University and Tufts Medical Center. She is a 2017 graduate of the Women in Bio Boardroom Ready program. For additional information on Cardurion Pharmaceuticals’ leadership team, please visit the company’s website: http://www.cardurion.com. CAMBRIDGE, MASS. – [June 26, 2018] – Cardurion Pharmaceuticals, a biotechnology company focused on the development of novel, next-generation therapeutics for the treatment of cardiovascular diseases, today announced that it has assembled world-class Scientific and Clinical Advisory Boards. Cardurion Pharmaceuticals is pleased to share the members of its Scientific and Clinical Advisory Boards. For additional information on Cardurion Pharmaceuticals’ Scientific and Clinical Advisory Boards, please visit the company’s website: http://www.cardurion.com. CAMBRIDGE, MASS. – [April 16, 2018] – Cardurion Pharmaceuticals, a biotechnology company focused on the development of novel, next-generation therapeutics for the treatment of cardiovascular diseases, today announced it has entered an exclusive licensing agreement with Astellas to develop and commercialize CRD-733, a PDE-9 inhibitor with the potential to improve cardiac function in heart failure patients. Under the terms of the agreement, Astellas has granted Cardurion Pharmaceuticals an exclusive, worldwide, royalty-bearing license, to research, develop, manufacture and commercialize CRD-733 for the diagnosis, prevention and treatment of cardiovascular-related indications in humans. Heart failure is a chronic, progressive syndrome in which the heart is unable to adequately meet the body’s needs for blood and oxygen, resulting in shortness of breath, fatigue, and fluid retention. Heart failure can occur with either a weak heart muscle that cannot adequately eject blood, or a muscle that is strong enough, but other factors limiting its ability to fill or increase function, as needed, are impaired. Over 6 million people in the United States have one of these two forms of heart failure1, and this unmet medical need poses the greatest challenge in cardiovascular medicine today. Recent evidence supports that inhibition of PDE-9 has potential to restore heart-protective mechanisms that are dysfunctional in both forms of heart failure. Astellas Pharma Inc., based in Tokyo, Japan, is a company dedicated to improving the health of people around the world through the provision of innovative and reliable pharmaceutical products. Astellas focuses on Urology, Oncology, Immunology, Nephrology and Neuroscience as prioritized therapeutic areas while advancing new therapeutic areas and discovery research leveraging new technologies/modalities. Astellas is also creating new value by combining internal capabilities and external expertise in the medical/healthcare business. Astellas is on the forefront of healthcare change to turn innovative science into value for patients. For more information, please visit our website at www.astellas.com/en. This press release contains forward-looking statements, all of which are qualified in their entirety by this cautionary statement. Any statements contained herein that do not describe historical facts, including, but not limited to, statements that express or imply future outcomes of our partnership with Takeda, are forward-looking statements that are based on management’s expectations and are subject to certain factors, risks and uncertainties that may cause actual results, outcomes, timing and performance to differ materially from those expressed or implied by such statements. These factors, risks and uncertainties include, but are not limited to: the costs and uncertainties associated with our research efforts and other discovery activities; the inherent uncertainties associated with the conduct, timing and results of preclinical and clinical studies of our product candidates; and the adequacy of our capital resources and availability of additional funding. Except as otherwise noted, these forward-looking statements speak only as of the date of this press release, and we undertake no obligation to update or revise any of such statements to reflect events or circumstances occurring after this press release. We caution readers not to place undue reliance on the forward-looking statements contained in this press release. Osaka, Japan and Cambridge, Mass., – 2 August 2017 – Takeda Pharmaceutical Company Limited (TSE: 4502) and Cardurion Pharmaceuticals today announced the creation of a new cardiovascular development partnership. Cardurion, a recently launched Boston-area based biotechnology company, is focused on the development of novel, next-generation therapeutics for the treatment of heart failure and other cardiovascular diseases. Cardurion is led by two physician scientists with extensive experience in cardiovascular science, medicine and drug development — Daniel Bloomfield, M.D., chief executive officer, and Michael Mendelsohn, M.D., founder and executive chairman. Takeda will jumpstart the new company’s discovery efforts by providing a 12-person cardiovascular research team from its Shonan, Japan site, including fully equipped laboratory space, development resources and licenses to a portfolio of preclinical-stage cardiovascular drug programs. The newly formed Cardurion is headquartered in Cambridge, Massachusetts and has research facilities in Shonan, Japan — with both locations surrounded by leading academic research ecosystems that support biotechnology and pharmaceutical companies. Cardiovascular disease is the leading cause of death worldwide in both men and women, accounting for more than 17 million deaths per year1, a number that is expected to grow to nearly 24 million by 20302. Heart failure alone affects more than six million patients in the U.S.3, with nearly a million new patients diagnosed each year3. Cardurion is a biotechnology company focused on the development of novel, next-generation therapeutics for the treatment of heart failure and other cardiovascular diseases. The company has facilities in Cambridge, Massachusetts and Shonan, Japan. For more information, visit http://www.cardurion.com. The forward-looking statements contained in this press release speak only as of the date of this press release, and neither Cardurion, nor Takeda undertake any obligation to revise or update any forward-looking statements to reflect new information, future events or circumstances after the date of the forward-looking statement. If one or more of these statements is updated or corrected, investors and others should not conclude that additional updates or corrections will be made. 1 World Health Organization. Cardiovascular Diseases Fact Sheet. May 2017. Retrieved June 2017. 2 World Health Organization. About Cardiovascular Diseases. Retrieved June 2017. 3 Centers for Disease Control and Prevention. Heart Failure Fact Sheet. Retrieved June 2017.